My Timesheet is an interface in Zoho Projects where you can access and manage your timelogs across different projects in one go. We shall learn how to make the best use of the My Timesheet widget and the Timesheet Reports here. Click to learn more about access privileges for Timesheets. You can log working hours across projects using My Timesheet. Click Home in the top band and navigate to the My Timesheetwidget. Here, you get an overview of the time-logs recorded in the past 7 days. To view the complete list of your time-logs, click View More in the upper-right corner of the widget. Since you are dealing with multiple projects in My Timesheet, you must select a project first when you log time. You can view timesheets in List, Grid and Calendar views. In List view, the tasks and bugs are displayed on a daily basis for the selected time period and you can also see the total billable and non-billable hours for that week. By default, the current week is displayed with its billable, non-billable and total status. In Grid view, the tasks and bugs are displayed within grids for the selected time period and you can also see the total billable and non-billable hours for that week. In Calendar view, total log time for both billable and non-billable is displayed against the dates in a calendar. You can click on a selected date to view its timesheet in List view. Click - Reports & Charts module in the left panel. 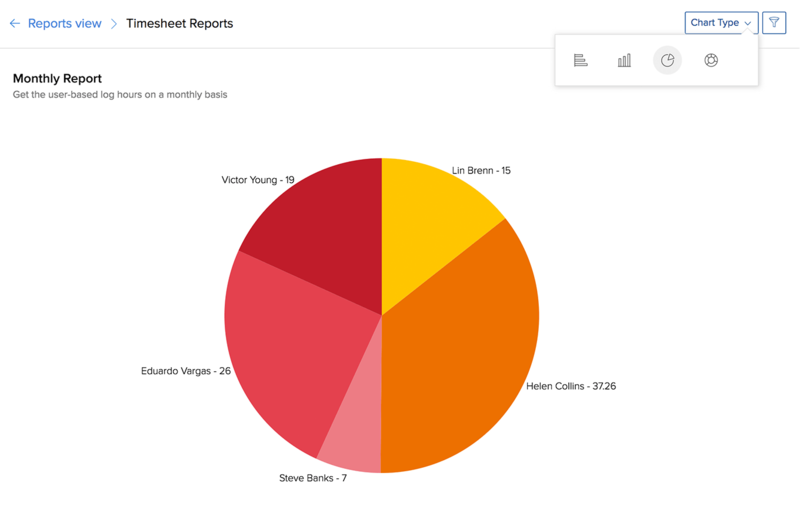 This report fetches you the time-logs recorded in the current month in the form of a pie chart by default. The users are differentiated by different shades. You can click on any shaded area to get the detailed timesheet information about the chosen user. You need to install latest flash player in your machine to view these reports.